A miracle occurred on the auspicious day of September 28 in the year 1929 when a lovely baby girl was born in the city now known as Indore in ' Sikh mohalla ' when the heavens blessed and all the stars were aligned . The proud parents, music stalwart Master Dinanath Mangeshker ji and mother Shudhdhmati were overjoyed as they named her Hema which was changed to Latika or Lata . Latika was a name in successful play Bhaav - Bandhan. This New name " Lata " remained with this baby girl who in the coming years who rose to dizzying heights of unsurpassed fame.
" Aayega aanewala " established her supremacy once & for all. Now in 2011 after almost 7 decades of her illustrious singing career , the fame and glory of her singing sensation has not diminished even an iota. The most unique VOICE of this world , is certainly hers but it is also a gift for all of us who are the generations born in an independent India . I call her " Didi " ! I have had the privilege to know her because of my Lata father Pandit Narendra Sharma a famous geetkar and poet . Hers is a voice that is interwoven with the very fabric of my life ..
Like the billion and more Indians who are my brothers and sisters I , too have enjoyed didi's voice which to me is ' Divine " for Me, Didi is the undisputed " Swar Samragnee " the Empress of Music "
she is , Sushri Lata Mangshker ji whom we all address as " DIDI "or our elder sister. Once again Sept. 28 th is here as we celebrate Didi's birthday & rejoice with her melodious songs. We listen to the treasure trove of great songs that we have with us and marvel again and again at the simplicity and the inherent sweetness and marvel at the beauty of her amazing voice ! The younger generations will wonder when they will hear her songs and they too will be soothed by the sweet lullaby and by the innumerable song our Didi has sung and which are now part of our everyday life soon they shall belong to the future generations which are still to come.I say she is , " अद्वीतियस्वरी " ! There is no one like her . I call her " Didi " ! Didi's voice is nectar like . Amrutmay = अमृतमय in Sanskrit .
" we did not hear Sangeet Samrat Tansen but we are very fortunate to be born in the same century as Didi and to have heard her songs " . Late Master Dinanath Mangeshkerji was himself a classical Master and his children have followed in their esteemed father's footsteps taking the family name ever higher to glory and to a non - perishable , eternal shining fame. As I look at the musically gifted " Mangeshker Family " I often remember Sant Gyaneshwar's family . There is a divine similarity . The Mangeshker siblings has the sweet songstress , the versatile Ashatai, the singer with a rustic appeal Ushaji and the reserved and shy Meenaji all who are expert musicians and artists of great caliber . Among these shining gems , Didi is , India's Kohinoor ! Our neighbor Pakistan envies us for having a singer like Lata Mangeshker. On every continent didi's songs are heard by appreciative audience. I have had the great fortune of knowing Didi from a very early age . To us children she was that smiling sweet Lady who walked in with golden payals making melodious tinkling sound as she came into our home and did Namaste to us in reply. Much later, as it was our privilege to be present in her august presence and to listen to her talk with my papaji late pandit Narendra Sharma and my amma smt. 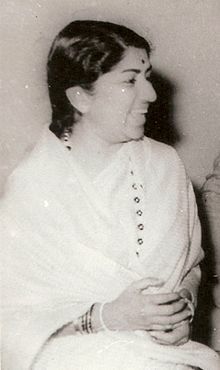 Susheela N. Sharma. Those were idyllic days. I often thought that those days would never end. but alas they did ! Now Papaji & amma are gone but the memory of those days remains , fragrant as ever in my heart and the images still vibrant and alive and as colorful as ever . Didi is that bridge which takes me back to my childhood home. Didi's generosity is boundless and her affections are true. I recall once when she saw us kids running to borrow Ice cubes from our neighbor's home . Didi did not like that & sent a fridge the next day & after much imploring , it was accepted because Papa did not want to accept it . He lived a spartan life . Didi said on papa's 60 th birthday that she would arrange a musical concert for papa's birthday but papaji said' if you are my daughter , come for a good simple meal and please do not bind me with maya or i will leave you all and head off to Kashi . " The proposed programme never took place but we all did eat together a home made meal prepared by my amma ! There are so many such memories which are present forever in my heart. I can vividly see , Didi arriving for our weddings with silk sarees and asking amma to keep it for us as we looked at her with tear filled eyes looking at our didi who never got married but was gracious and kind when we , her younger sisters were getting married ! How can i ever forget such warm and loving and selfless gestures ? Didi has shouldered her responsibilities with great aplomb and courage. After Master Dinanathji's untimely demise , his five children were blessed with passion for music and nothing much else. Latadidi took charge of the family and they faced hard times which were soon to become a thing of the past as didi excelled in hindi film music field with one super hit one after other and became an icon by '50's ! a " chaap " which is HERS & hers alone !! She is what she comes across in her singing . Didi is a BEAUTIFUL FEMALE, inside & out. a great human being ! the sound of the eternal , manifest . The anhad naad which can be heard in sweet tones is didi's voice that we hear and it is prasad of Mata Saraswati . On a human level, Didi loves perfumes and PARIS by Yves Laurent the French perfumers creation is her most favorite scent. There is a scent created by her on her name " Lata " also . She has created some exquisite gem studded jewelery which has raised thousands of pounds for charity. She loves cricket and supports Indian cricket Team. Didi has sung for charity and raised millions for worthy causes . She is a staunch supporter of India and her troops and her song " Ai mere watan ke logon " has brought tears to the eyes of prime minster Jawahar Lal Nehru . She has sung bhajans written by Smt Lalita Shastriji widow of Shri Lal Bahadur Shastrriji and poems of Shri Atal Bihari Bajpayee ji. Didi has sung with Pt. Bhimsen Joshi the songs were written by Papaji for this album titled - " Ram Shyam Gun gaan "
fir aise hee gana ko release ker dijiyega "
those wonderful moments and i wish to lord almighty to keep my Didi , safe and happy and smiling and I wish Didi a very Happy Birthday & ask her blessings . Didi is DIDI! There is No One like her. I'm her bhakt perhaps like All of you here. the effect of this song was mesmerizing . I felt, what I'd felt many a times before . Latadidiji was singing this song just for me !
' She is surely a " CELESTIAL BEING " come down to pass this Life among all of US & we r the privileged Ones to hear her singing so many songs with so many different hues which evoke so many different emotions in our hearts to echo silently & surely on this spot in the vastness of Time & space to make US ONE with the infinite !! That is the magic of her voice. Then I called her and told her how much I loved this song. that was yet another privilege to hear her tinkling laughter which I ALWAYS compare to tiny BELLS made of PURE GOLD ! Not even SILVER bells can have that sound the golden ghoonghroos make that is Didi's laughter ! It is like the sheerest of ( maheen ) clean muslin cloth which can pass through a Ring !! Gossamer being of music Divine we are mesmerized by Thee . How do I compare Thee O Didi ? To what shall I compare Thee ? for the One & Only = MY DIDI = Lata Didi !!! भारत रत्न , विश्व रत्ना स्वर साम्राज्ञी लता मंगेशकर जी को जन्म दिन की अनेकों बधाईयाँ ! स्वर साम्राज्ञी आदरणीया लता मंगेशकर जी को जन्म दिन की अनेकों बधाइयां और मंगल कामनाएं ! नवरात्रि पर्व की बधाई और शुभकामनाएं ! हम सब की लता मंगेशकर और आपकी प्यारी दीदी को जन्मदिन की हार्दिक बधाई और शुभकामनायें! आपको जन्मदिन की बहुत बहुत बधाई !! लता मंगेशकर जीऔर आपकी प्यारी दीदी को जन्मदिन की हार्दिक बधाई और शुभकामनायें!